The top desktop graphics card based on the NVIDIA GeForce Kepler 104 (GK104) ASIC, which has come to be known as GeForce GTX 670 Ti, is reported to use a 5 NVVDD phase power supply (VRM) design that draws power from 6-pin and 8-pin power connectors. The card will hence have 300W of power at its disposal. NVVDD phase 1 and 3 will be wired to the 6-pin connector; phase 2, 4, and 5 to the 8-pin connector. NVVDD phases 2, 4, and 5 feed power to the GPU, while phases 1 and 3 power the GDDR5 memory and other components on the board. Is this really surprising anyone? So then the 680 will be double 8 pin? Usually the x70s have less pins than the x80s. The 6+8 pin configuration could be there to give it that high-end 'feel', even if it doesn't need 6+8 pin (and can do with 6+6). Looking at the power figures of the HD 7970, for example, you'll see how the 6+8 pin config is a little overkill. Seems that nV is going for outright performance rather than performance per watt. Shame, a double win would have been a win for all. All the extra two pins are is Ground. We have ran a 5870 off two PCIex 6 pins fine. Like those extra grounds make a damn bit of difference. 6 total 12V+ wires and 8 ground, I would worry more about the board trying to supply too much power through the socket and frying than two extra grounds. I think me and bta agree. Imagine gk104 has perf/clock between pitcairn (20% faster core) and 7970 (20% faster through core + bus width difference). What happens when your card is limited to 950mhz at 225w and your lesser competitor is not at all constrained by tdp on a process capable of 1200mhz give or take at reasonable and/or perhaps stock voltage? I'll tell you who you are...nvidia. If they want to compete against 7950 and not 7870 they will need the tdp of 7970. You also have to remember that 6-pin only requires 2 +12v wires, even though most good PSUs use 3. The 8-pin spec requires all 3 +12v wires. The ampacity is not determined by the two extra grounds. In fact, are those two extra 'grounds' actually not simply 'sense' wires that do not even carry current? Correct, in fact in a lot of 6+2 power supplies, the 2 extra ground pins are just split from two of the other ground wires. 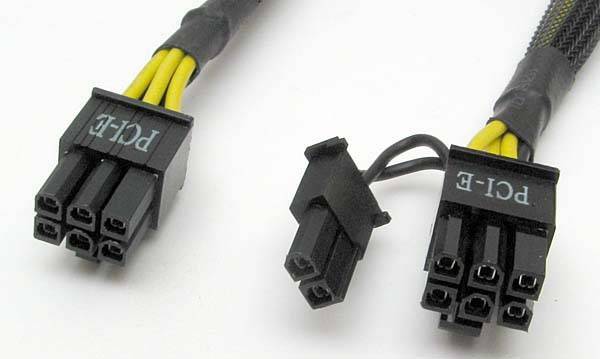 So they only run 3 ground wires from the PSU to the connector, then split the extra two pins off from them, you can even tell that is what they are doing in the picture shown as an example. However, those two being there guarantees that the 3rd +12v wire will be there, which is really the important thing.